Apron "Got Zeppole?" Apron "It's Gravy Not Sauce!" Apron "It's macaroni, not pasta!" 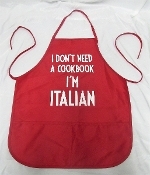 Apron "I Don't Need A Cookbook, I'm Italian"
"I DON'T NEED A COOKBOOK, I'M ITALIAN" RED APRON.